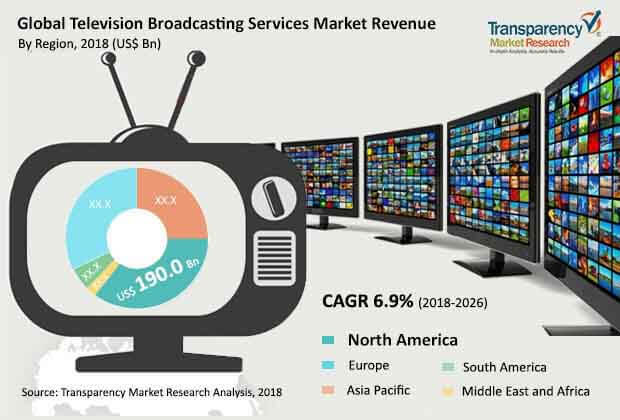 The global television broadcasting services market is anticipated in a report by Transparency Market Research (TMR) to find companies shaking hands with technology firms with a view to expand their presence in the industry. Companies could also focus on aligning their distribution and production operations to help secure a leading share of the market. Besides this, there could be high emphasis on improvement of services with respect to content quality. The market marks the presence of top companies such as CBS Interactive, CANAL+ GROUP, British Broadcasting Corporation (BBC), AT&T, Inc., and A&E Television Networks, LLC. TMR envisages the global television broadcasting services market to rise at a 6.9% CAGR for the forecast period 2018-2026 to earn US$755.7 bn by the completion of 2026. In 2017, the market was valued at a US$418.1 bn. On the basis of delivery platform, it is envisioned to witness the rise of cable television broadcasting services throughout the course of the forecast period. By region, North America could take the lead in the market, considering its US$190.0 bn valuation achieved in 2018. The global television broadcasting services market is foreseen to gather pace in its growth with advertisement regarded as a leading revenue source and rising demand for HD content. The shift in trend from provider-driven to consumer-driven observed in the television market could bode well for the rise of broadcasting services. Increasing consumer expectations could be met with technological advancement in the manufacturing of devices and rising quality standards. With swelling consumer preference for high-quality content, demand for top-end over-the-top television (OTT) services such as HBO Go is expected to improve in the near future. In 2017, ownership of HD televisions touched 85.0%, according to the finding mentioned in the Ericsson Mobility Report 2017. The growth of the global television broadcasting services market is predicted to decline with limited reach of television due to the implementation of intangible and stringent regulations of different nations. However, the need of enterprises to reach potential customers and large audiences could create demand for television broadcasting services during the course of the forecast period. With increasing number of channels and its wider reach, television is proving itself as a prominent vehicle to reach people and improve business operations through its various platforms. Rise of the subscription revenue model owing to increasing adoption of on-demand and pay TV services is projected to set the tone for valuable growth in the global television broadcasting services market. On the other hand, advertisement revenue model could attain demand with increasing digitalization in different parts of the world.